Do you want to have a fresh start & forget about your hoarded home? The Anxiety and Depression Association of America (ADAA) defines hoarding as “the compulsive purchasing, acquiring, searching, and saving of items that have little or no value. 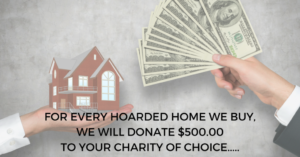 The behavior usually has harmful effects—emotional, physical, social, financial, and even legal—for the hoarder and their family members.” We understand this might be a stressful time for you and the family. We are here to ease the pain and hassles you may be facing, by purchasing the hoarded house quickly with cash.